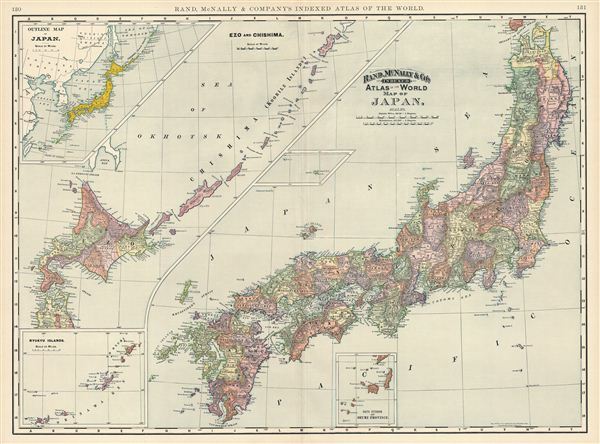 This is a beautiful example of Rand McNally and Company's 1892 map of Japan. Divided into two parts, the first focusing on the southern islands of Japan (here identified as Nippon), while the second details ezo (Yesso), that is northern Japan including Hokkaido. Three insets include an outline map of Japan, the Ryuku Islands, and the South extension of Osumi Province and the Taka and Matsu Islands. This period in Japan, part of the Meiji Reign, witnessed Japan's transformation from a feudalistic society into a modernized nation. In 1894, the First Sino-Japanese War (August 1. 1894 - April 17, 1895) would be fought between Qing Dynasty China and Meiji Japan over the control of Korea and Taiwan (Formosa). Japan would go on to win both this and the Russo-Japanese War of 1904 to gain control over Korea, Taiwan and the southern half of Sakhalin. Color coded according to region, this map identifies numerous cities and towns, as well as notating rivers, mountains and various other topographical details. Telief shown by hachure. This map was issued as plate nos. 130 and 131 in the 1895 issue of Rand McNally and Company's Indexed Atlas of the World - possibly the finest atlas Rand McNally ever issued. Rumsey 3565.034 (1897 edition). Philip (atlases) 1026 (1898 edition).